Sacha Inchi, also known as the "Incan peanut”, is among the best plant sources for Omega-3, Omega-6, and Omega-9 essential fatty acids. A nutritious oil with a mild and nutty taste is extracted from the dark brown seeds of these fruits. 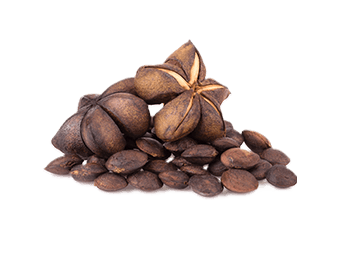 Rich in protein (about 60% by weight), Iodine, Vitamin C and antioxidant Vitamins A and E, Sacha Inchi is full of essential and non-essential amino acids, and has only 6% saturated fatty acids compared to its 90-93% unsaturated fatty acids. A healthy intake of omega fatty acids supports the body in many ways. With an average of 48% omega-3s, Sacha Inchi is very helpful in vegetarian diets as a plant source of these important nutrients.